The Department of Transportation (DOT) has federal requirements that may apply to some transport of pesticides. Federal requirements vary, depending on the type of pesticide, amount, concentration, and distance transported. Farmers may have special exceptions from some of the regulations, as explained in the following two paragraphs. A farmer is granted an exception from the DOT HazMat regulations if he or she is a private motor carrier transporting pesticides within the state. A farmer can transport DOT-defined hazardous pesticides (http://pubs.cas.psu.edu/FreePubs/pdfs/XO0001.pdf) (other than compressed gases) between fields of the same farm over any roadway except the interstate highway system. The emergency response information and HazMat employee training requirements are waived for farmers when they are transporting agricultural pesticides to or from their farm (within 150 miles of the farm). This exception does not apply if you are transporting pesticides for someone else for compensation or trade. You are transporting no more than 502 gallons of a liquid or gas agricultural product or 5,070 pounds of a solid agricultural product. You are a farmer who is an intrastate private motor carrier. However, this exception regarding emergency response information and HazMat employee training requirements does not apply if you are transporting pesticides for someone else for compensation or trade.Each person involved in the transport process must be instructed and aware of applicable requirements. Obtain a Commercial Driver’s License (CDL) when required. When you transport any hazardous pesticide, carry the proper shipping papers in the passenger compartment of the vehicle. While you are driving (belted and operating the vehicle), the papers must be within your reach and readily recognizable by emergency personnel or placed in a door pouch. These papers have information that you can use to prevent further damage or injury from the pesticide in case of an accident, including an emergency response telephone number. Your pesticide dealer will help you obtain the proper papers. 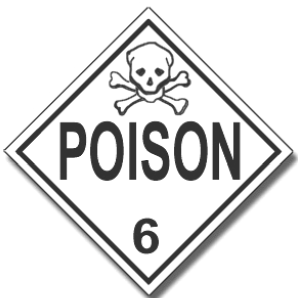 Also, carry the MSDS for each hazardous pesticide or an emergency response guidance manual (http://www.phmsa.dot.gov/staticfiles/PHMSA/DownloadableFiles/Files/Hazmat/ERG2012.pdf) that cross-references a chemical’s shipping name with emergency response information. Review these shipping papers prior to leaving with the pesticides. They may have important emergency response contact information, which would be good to know before an emergency occurs. The DOT HazMat training increases your awareness of safety considerations involved in loading, unloading, handling, storing, preparing shipping papers, marking, labeling, placarding, and transporting hazardous pesticides. It also improves emergency preparedness for responding to transportation accidents. HazMat training includes general awareness training, function-specific training, and safety training. 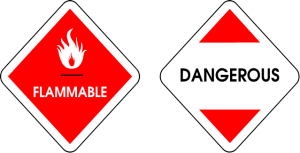 The DOT Office of Hazardous Materials Safety has developed training modules that meet the requirements for general HazMat training. These modules are available online (http://www.phmsa.dot.gov/hazmat/training/publications/modules), or on an interactive CD-ROM (call 202-366-4900 for information). A list of training opportunities for the function-specific and safety training sections is available online,(http://www.phmsa.dot.gov/hazmat/outreach-training) or can be obtained by contacting the DOT Office of Hazardous Materials Initiatives and Training at 202-366-4900. Specialized training is available from the DOT Transportation Safety Institute as well (405-954-5000). Always check each package – cardboard box, metal drum, etc. – to be sure it is properly labeled and/or marked by the manufacturer. 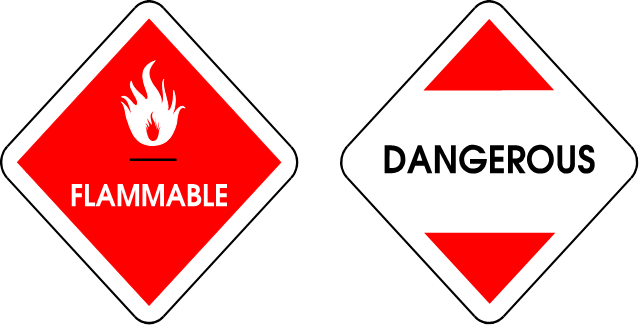 Labeling means a prescribed hazard warning notice,(IMAGE OR ILLUSTRATION) usually diamond-shaped, is on the outer package. Marking means the required words are written on the side of the outer package, including shipping name; identification number; specifications or UN marks; plus other required information, instructions, or cautions. 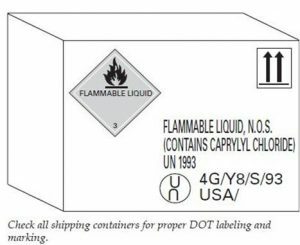 When you purchase a pesticide product, check the Material Safety Data Sheet (MSDS) for shipping and transport information. This information is not required to be part of the MSDS, but is often included. Take that information and refer to the HazMat Table 172.101 (http://setonresourcecenter.com/transportation/49cfr/172_101tb.pdf). This table has columns of information that include shipping and transport requirements. Also, your Ag chemical supplier will have information on requirements and safety considerations when transporting pesticides. The best way to dispose of a small amount of an excess pesticide is to apply it to a site (a specific plant, animal, or structure) permitted on the label for which the product is registered. Check the label to see that the site is listed, and that you will not exceed the maximum application rate. There may be occasions when you cannot dispose of pesticides in this way, and must transport them. Certain pesticide wastes are listed as hazardous under the Resource Conservation and Recovery Act (RCRA)(http://www.epa.gov/lawsregs/laws/rcra.html). RCRA defines “hazardous wastes” (40 CFR parts 240-299) as either listed substances or characteristic wastes. Listed substances (http://www.epa.gov/waste/hazard/wastetypes/listed.htm) are given in the Code of Federal Regulations 40, parts 261.3 and 261.32. These pesticide wastes have been declared to be hazardous wastes when they are no longer used and will be disposed. Characteristic wastes are waste materials that have one or more of these characteristics: ignitable, corrosive, reactive, or toxic. Wastes with these characteristics are considered hazardous wastes even though they may not be listed. Except for someone taking his or her own pesticide wastes to an approved excess pesticide waste collection/disposal site, only a permitted hazardous waste hauler can transport such waste. For more information, contact the hazardous waste specialist at the environmental agency in your state. The National Pesticide Information Center has a list of state pesticide regulatory agencies that (http://npic.orst.edu/reg/state_agencies.html) may be able to answer state-specific questions. This link will take you to another site (http://www.epa.gov/epahome/state.htm) that may point you to state agencies to help you get answers to local questions.